From north to south and east to west, no matter the region, one of the most coveted of features in homes and apartments is an outdoor living space. Especially desired above all is a covered dining or living room or combination of both. Today, for your design inspiration we are sharing with you ten stunning examples of outdoor rooms. Enjoy! 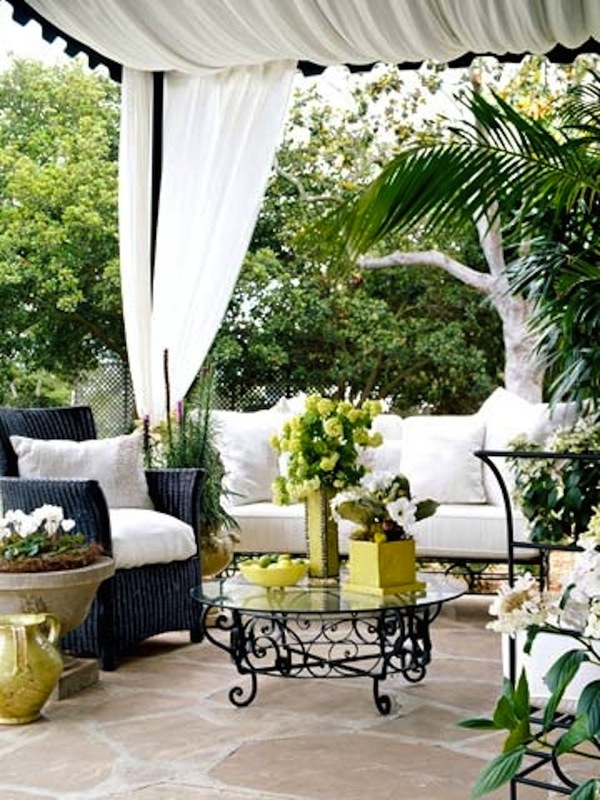 Elegant and graceful is this draped outdoor dining room. With furnishings that from concrete to upholstered, it’s a chic dining space with a fantastic view of the natural landscape beyond. With a watery view and furnishings fit for any indoor living room, this is a sumptuous outdoor living space. Aren’t the coffee tables exquisite. 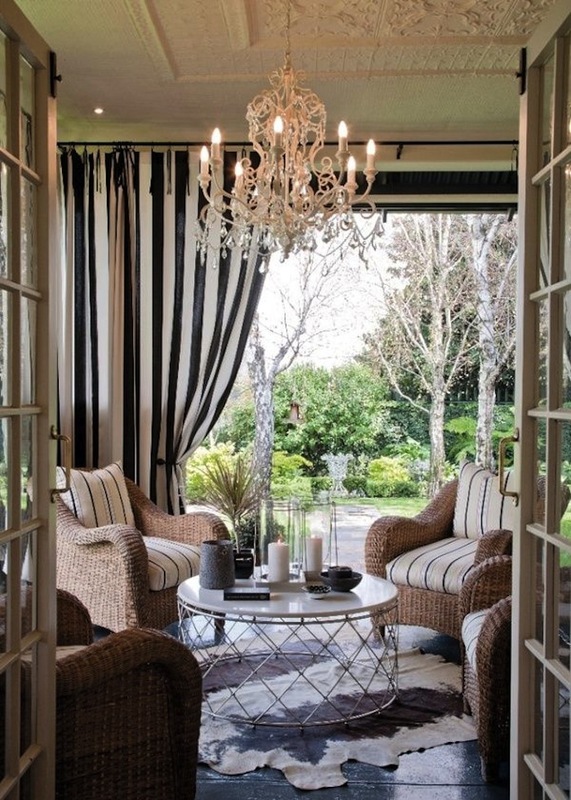 Black and white stripes make for a cool sheltered outdoor sitting room. With comfy cushioned chairs, a cowhide rug and wire and marble cocktail table, this is a small inviting space. 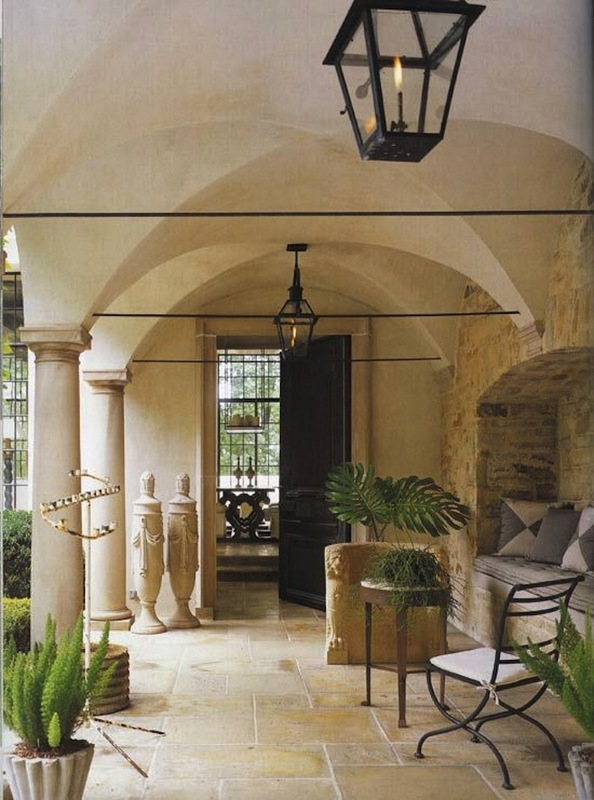 A brick-enclosed bench creates an inviting focal point in a covered portico that’s both beautiful and practical. We love the black wrought iron touches. 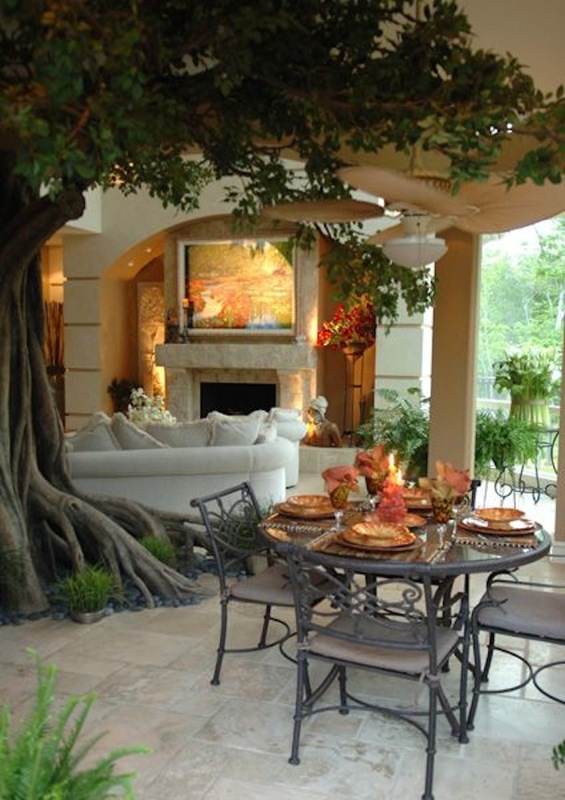 Comfortable and cozy, this covered space with its own sprawling tree offers a place for relaxing and dining outdoors. Wrought iron and soft upholstery are a study in contrasts. 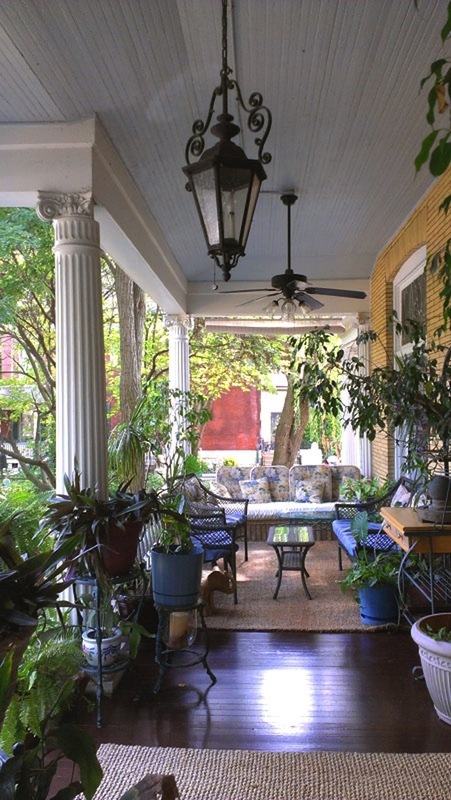 Wrought iron and wicker beckon on this greenery-filled porch. Sisal rugs bring comfort underfoot. 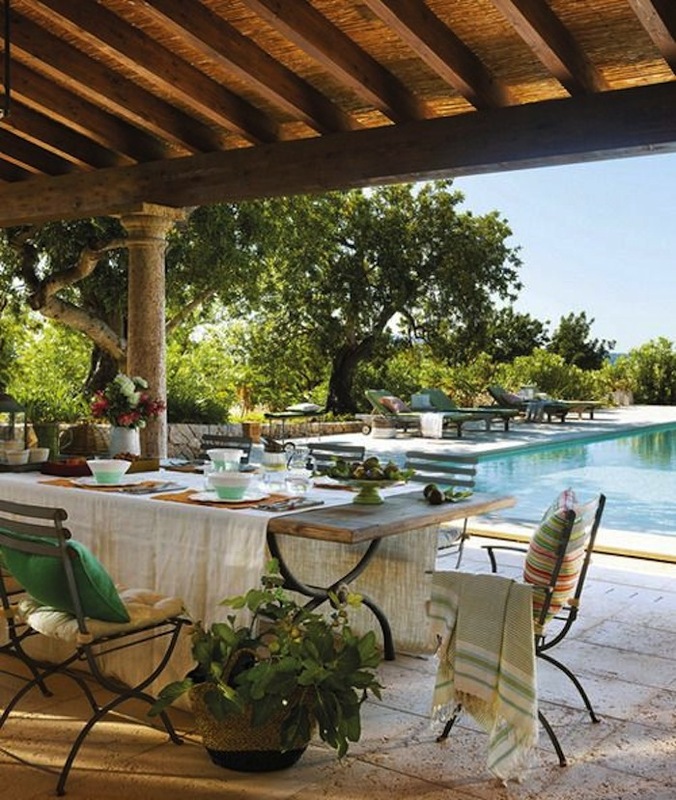 Here, dinner is served beside the pool on this spacious covered patio. 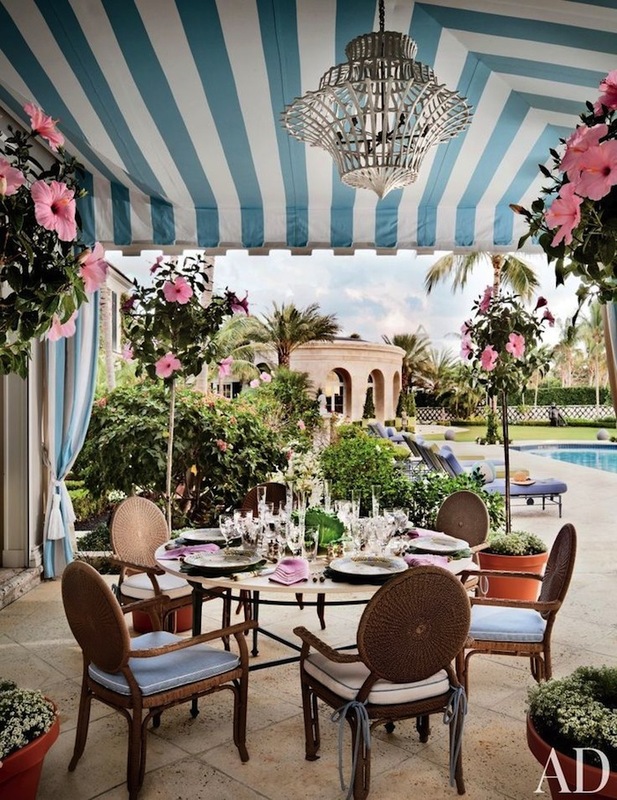 A striped awning and drapery panels bring a festive look to this outdoor dining space. Woven chairs offer seating around a large iron and marble table. Perhaps we’re late for the party? Image Sources: Pinterest.com; DesignFile.ArchitecturalDigest; ByStephieLynn.com; Blog.AtHomeArkansas.com; DustJacketAttic.tumblr.com; HowardBehrens.com; AllThingsElegant.tumblr.com; ThingsThatInspire.com; MargeCarson.com.